How to choose the right roofer, if you know that you need professional repairs to your roof, ensure that you’ve chosen the right roofer before you shell out lots of cash. 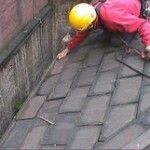 Professional roofing is a highly skilled job. Having your roof fixed is not just about keeping the rain out; if you have serious roof problems, you may be putting your personal safety and that of other occupants, as well as your possessions, at risk. So ensuring that you get the job done professionally by choosing a good roofer is a big responsibility. When you’re looking for a roofing contractor, it’s worth shopping around before you make a decision. If you’re browsing through a phonebook or online, you might find lots of local roofers and you may be left wondering how to choose the best roofer. Firstly, it’s a good idea to ask around – there’s nothing better than a reference from a neighbour, friend or someone you know. In fact, you should aim to get at least three references from satisfied customers. A good tradesman will be happy to refer you to former clients who are happy with their work. If they’re reticent about providing you with references, it’s probably a bad sign. A good roofer will have a permanent address. This is usually a sign that the firm has been established for some time and is reputable. Check the phone number and permanent place of business, tax identification number and business licence, if they have one. Ask the roofer if they’re members of a reputable trade body. Don’t just take their word for it – check the facts for yourself. A trade body will usually ensure a high standard of work and the roofer will usually have to adhere to strict guidelines so you’ll be more confident about the standard of their work. It is essential to ask about insurance. Roofing is a high-risk activity and this step to finding a good roofer is very important. Make sure that the roofer you pick is fully insured and that the insurance is valid throughout the duration of the work you are having done. If this were not the case and an accident were to happen, then you could run into real trouble and find yourself liable for any injuries that occur while they’re working at your property. Make sure your roofer is fully trained in all aspects of health and safety, and that their qualifications are up to date. It may sound obvious, but discuss your requirements with the roofer. Talk through your needs and tell them your expectations. Get a firm idea of how they can help and if they have the right experience and expertise to undertake work on your property. Different roofers may specialise in different areas, so if you’re not sure whether the roofer is up to the job, move on and research another one. Most roofing firms will be happy to talk through your options with you and should offer advice over the phone without charge. If you’re happy with what they’re saying and you want to proceed, ensure you get a detailed, written proposal before they start any work. The proposal should include the estimated start date and the date of completion. It should also include details of the payment arrangements you’ve agreed to. Finally, choose a roofer based on the quality of their work. Use their work history, references and membership of professional bodies to judge this. Don’t just choose the cheapest roofing firm or you could end up forking out more money to fix their mistakes. For professional roofing, home maintenance, window fitting and much more, contact G&A. We are a reputable roofing firm that has been delivering quality repairs for over 25 years. Call our qualified team of roofers to discuss your requirements today on 0800 626430.